Whenever the topic of education comes up in our community, there is a common refrain: “What about the parents? How do we engage parents in their children’s education?” This past Saturday, the team at Uplift Peak Preparatory piloted a new program called “Parent University” to address this question directly. The team at Uplift Peak used some smart marketing tactics to ensure awareness and attendance amongst its parents, utilizing an automated voicemail/text messaging system and sending younger students home with stickers on their shirts which read: “Will you be at Parent University?” Perhaps their most ingenious draw: raffling off an iPad Mini at the event, for which students nagged their parents to stay until the program’s end. The Uplift team plans to debrief fully as a team, reviewing parents’ exit surveys and reflecting on ways to improve. It’s still to be determined how frequently Parent University can or should be offered or how quickly it might be scaled to Uplift’s other campuses. 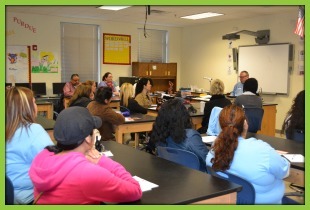 Regardless, Saturday proved one thing: it may not be easy, but parents are ready to be meaningfully engaged. The question remains: How serious are we, as schools and as a community, about creating more of these opportunities for parents?